This report contains a summary of the breaches reported to the OCR during the month of September, 2014. Large scale data breaches continue to plague the healthcare industry. 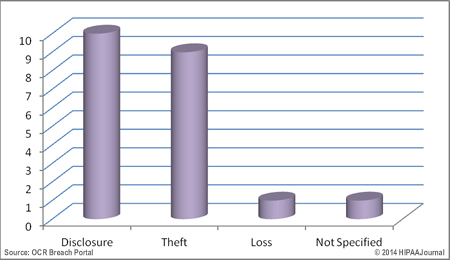 Last month saw well over 4 million records exposed in hacking incidents, laptop thefts, improper access, disclosure and disposal or records. This month, while there were fewer incidents reported, most of which involved a few thousand records, Xerox State Healthcare, LLC (TX) reported a massive data breach in which approximately 2 million records were exposed. The incident was atypical for a HIPAA breach. Rather than records being exposed by hackers or the theft of computer equipment, this breach was caused following the cancellation of a contract between Xerox and the Texas Health and Human Services Commission. After the contract was cancelled, Xerox failed to return computer equipment containing PHI, potentially leading to that information being exposed. Valesco Ventures (FL), a Business Associate of Aventura Hospital and Medical Center, reported a HIPAA breach which affected 82,601 individuals after an employee allegedly accessed patient health records without authorization. Cedars-Sinai Health System (CA) reported a data breach involving 33,136 patients after a laptop containing unencrypted PHI was stolen from and employee’s home, while Bulloch Pediatric Group, LLC (GA) also reported a burglary in which 10,000 old insurance records and other payment records were stolen from its facilities. 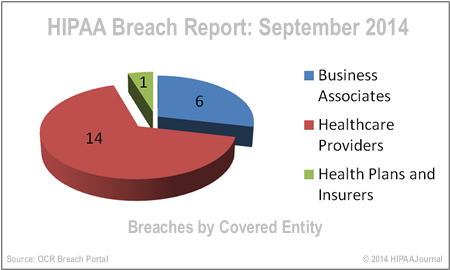 In September, 2014, a total of 2,153,087 individuals were affected in 21 HIPAA data breaches. 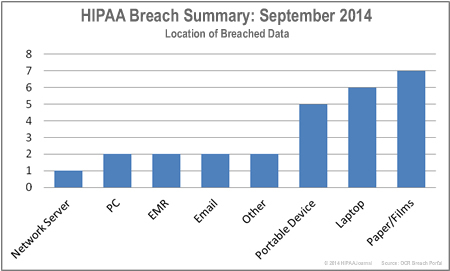 The total number of victims of HIPAA breaches in Q3, 2014 was 8,244,381. The total number of breach victims so far reported in 2014 is 11,512,220. The theft of laptop computers and unauthorized accessing of PHI accounted for virtually all of the breaches reported to the OCR in September. Only one health plan registered a data breach in September, so it is healthcare providers that dominate the OCR data breach reports, registering 14 incidents for the month. Business Associates only registered 6 HIPAA breaches, but that included the massive 2-million record breach at Xerox State Healthcare. 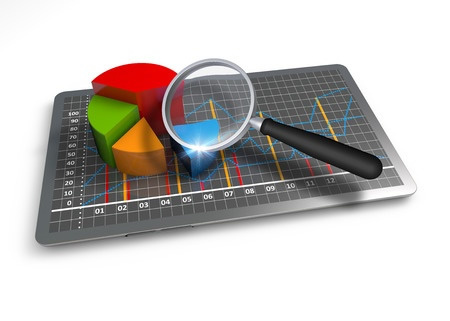 No healthcare clearinghouses recorded breaches in September.